Over 20 million United States and Canadian frontline food workers grow, process, distribute, cook, and serve the food that is eaten by over 355 million consumers every day. They are the vital link of a complex food system from farm to fork. And every day, each of the 20 million food workers makes individual decisions that impacts food safety, workplace safety, product quality, and operations. Despite the food worker’s importance to the food industry and consumers, there is limited research to understand the food worker’s motivations, attitudes and perceptions about their workplace. In order to increase our understanding, the Center for Research and Public Policy (CRPP) conducted an independent online survey among 1,203 food workers across the entire food system. Additionally, CRPP surveyed 79 food industry leaders to identify any perception gaps between frontline workers and corporate leadership. The study was commissioned by Alchemy Systems. 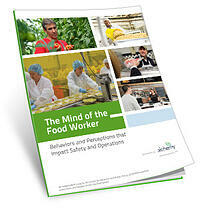 Thank you for your interest in the Mind of the Food Worker research study.